When I was a kid, my Sicilian grandmother used to make this with cardoons, a thistle-like plant that grew as a weed she picked down by the railyards in Painesville, Ohio. Place the stalks from the swiss chard into a pot of water, bring to the boil and simmer until tender, about 15-20 minutes. Place fresh bread crumbs in a dish, and the beaten egg in another. Heat the oil until a small piece of bread sizzles in it. Drain the stalks, dip in the beaten egg and then in the bread crumbs. Deep fry in small batches and drain on paper towels. Season with salt and pepper. Serve with a yogurt and garlic dip. If you have some well flavoured home-made chicken stock around, use it instead of the water and omit the boullion cube - otherwise make a quick one by sauteing the onion in the oil, add the garlic and the chicken pieces. Saute chicken until slightly brown. Add the water or stock, the bay leaf and the bouliion cube, and simmer until chicken is cooked, about a half hour. Remove the bay leaf and discard. Remove the chicken and break up into small shreds. Add it back to the stock. Add the creamed corn and stir. Mix the cornflour in half cup of cold water and stir into pot. Stir in the beaten eggs and the black pepper. Simmer over low heat until soup thickens. Serve hot. This recipe uses flat unsalted white anchovies in oil rather than the rolled salted brown ones in jars and tins. Seek these out in specialty delis. Cut an end off an orange. Remove the pith and dice into 5 cm squares. Heat about a half-cup of olive oil in a fry pan. Add the orange peel and sauté for two minutes. Add the rosemary sprig, the garlic and the mixed olives. Sauté until rosemary is crisp, careful not to burn the garlic and until the olives are puckered. On a serving plate, lay out the anchovies on one side and on the other place the olives. Put the rosemary sprig on top of the olives, the garlic around and spoon some of the hot oil and orange peel over the top. Shake a couple drops of balsamic vinegar over the top (just a bit, not too much). Serve with crusty bread as an appetizer. Prepare the Bacalla Calabrian Style, in advance, as per recipe, replacing Ligurian olives with large green and black Italian olives marinated in brine, not vinegar. Side of salt cod (fillets), soaked for one or two days, changing the water a couple times each day. Cut away all the bones. Leave the skin on. Note: Cut each piece of fish into 1 inch squares so it will be easier to combine with the pasta. Cook the pasta al dente in a separate pot of boiling water. Heat olive oil until smoking. 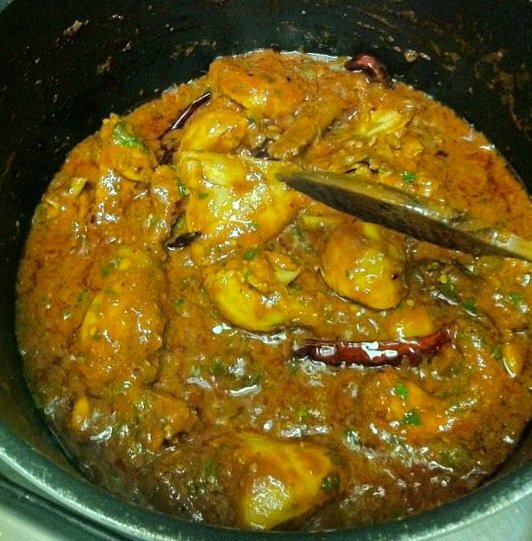 Add tiger prawns and toss until the oil catches fire and the prawns are braised in the flames. Add the garlic and toss. From the previously prepared pot of bacalla, choose a dozen squares of fish, some tomatoes, some fennel, some olives and spoon some of the sauce into the pan. Add salt and freshly ground black pepper liberally. Toss well. Sprinkle with a liberal dose of olive oil. Add the drained pasta to the pan and combine thoroughly. Serve with the chiffonaded parsely and fennel greens as garnish. 1. Place the ice cubes in the bottom of a metal bowl (or any bowl) and pour in the cold beer. Stir in the flour, salt and pepper until a smooth batter forms. Let rest for a half hour or more. 2. Separate the onions into individual rings (leave some bunched up for variety) and place in a separate bowl. 3. In a large pot or fry pan, heat the oil until a drop of batter starts to sizzle. 4. Put a handful of onion slices into the batter and coat thoroughly. 5. 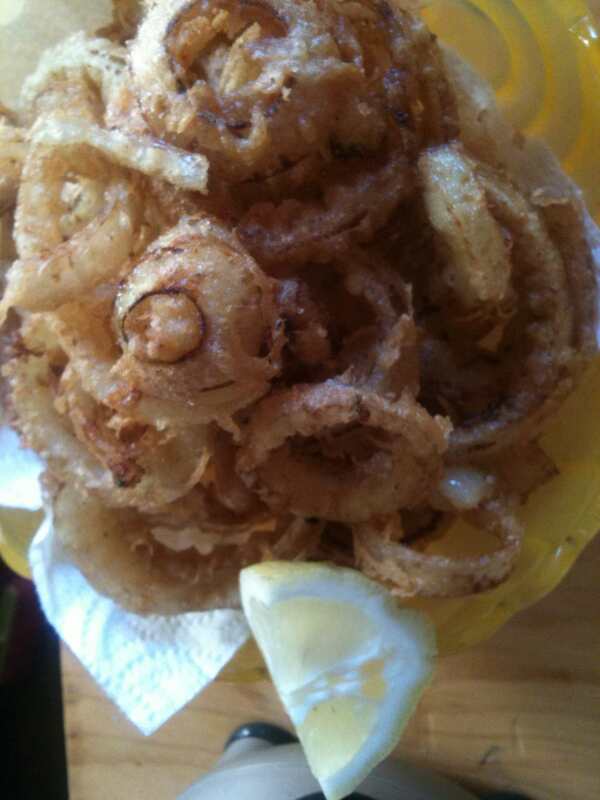 Using the tongs, lift each onion ring out of the batter, shake a little and deep fry, five or six at a time until golden. Leave enough room to move so they don’t stick together. If they do, just separate them with two pairs of tongs. Remove and drain on paper towels. Salt and place in a serving bowl lined with a couple sheets of paper towels. 6. Every other batch, remove the pan from the heat to allow it to cool slightly and with a slotted spoon remove the burnt bits of the batter so it stays clear. Place the pan back on the heat and repeat until all the onion slices are finished. 7. Serve with lemon wedges and tartar sauce. 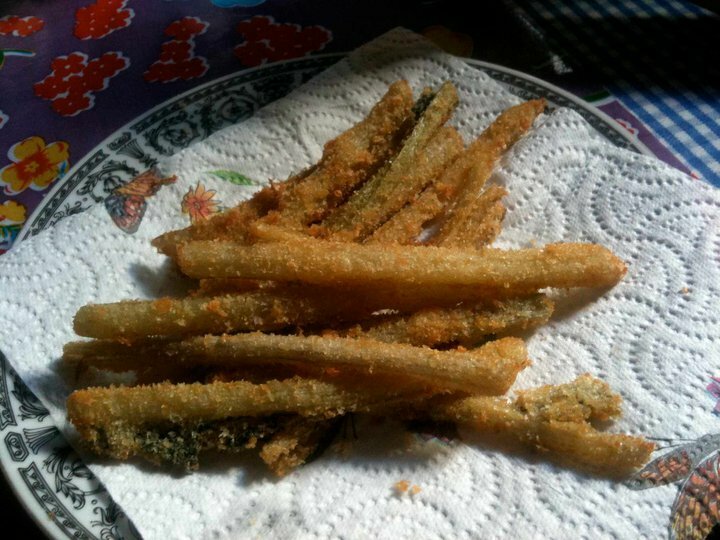 Note: The beer has enough yeast in it to create a thin perfect tempura-like batter. 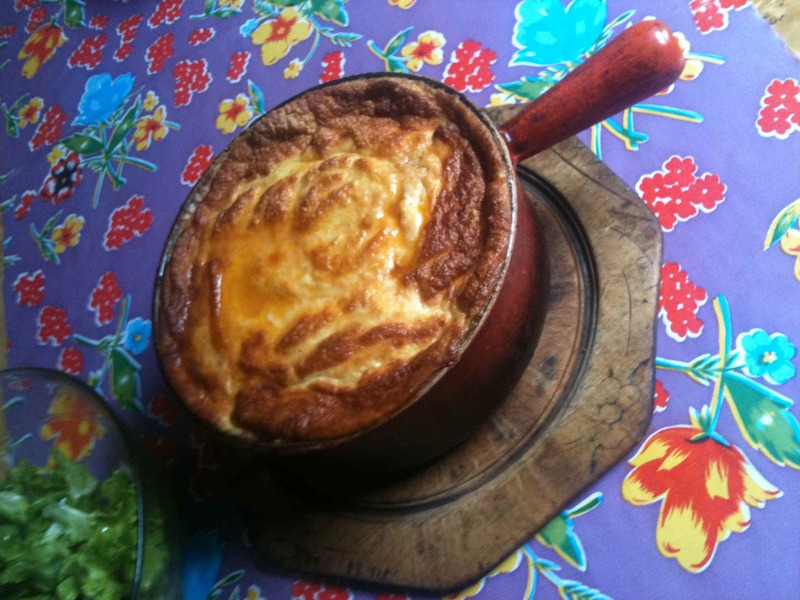 It is not necessary to add eggs or baking powder. I keep a separate bottle of safflower or peanut oil that I only use for deep-frying. When I’m finished, I let the oil cool, strain it and put it back in the bottle for the next time. Cook the scrubbed potatoes in boiling water until tender. Rinse under cold water and slice. Let cool slightly. Mix the remaining dressing ingredients in a bowl. Dry fry the seeds (separately) and grind with a mortar and pestle. Grind the curry leaves and cinnamon stick. OK. That’s where I started. Grind it all together in a mortar and pestle and set aside. 4 green chiles, turned over a flame or grill until black and the skin scrapped off. 1 stalk of lemongrass, white part only, pounded and tied into a knot. Put some olive oil in a deep fry pan or dutch over and brown the chicken pieces. Remove. Add some butter (be generous). You can replace the oil and butter with ghee if you prefer. Toss in the fresh curry leaves. Stir for a minute. Add the onion, garlic and red chile. Stir for a couple of minutes. Add about a half-cup of curry powder or more. Do not be afraid of overdoing it! Stir for about three minutes. Add the chicken pieces and toss in the spices. Add the lemongrass, kaffir lime leaf, palm sugar, green chiles, chopped coriander and about a 2 cups of water. Stir in the tomato paste. Stir thoroughly and simmer for about a half hour. Add the coconut milk and continue to simmer for another hour. Add a little more water if necessary. You want a nice gravy. Add salt to taste. Serve with steamed rice, yogurt and fresh coriander & sliced red chiles on the side. NOTE: You can also omit the coconut milk entirely for a different variation. I had this the other day for lunch at Mamasita in the city and decided to recreate it myself. 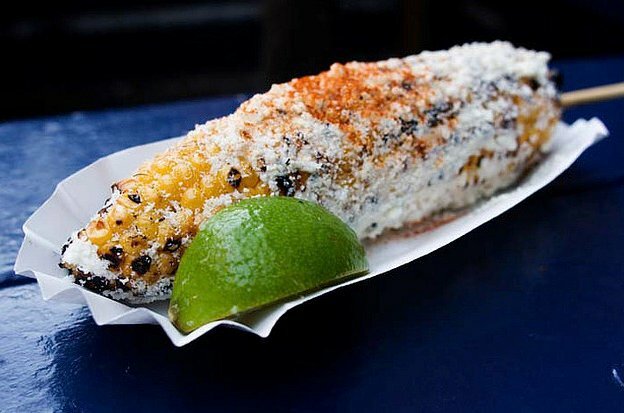 It is based on traditional Mexcian street-vendor fare. 1. Make the Chipotle Mayonnaise. Take one dried chipotle chile and fry in oil until it turns colour. Drain on paper towel and cut open removing and discarding the seeds. Tear the chile into pieces and soak in hot water for a half hour until soft. Put the chile pieces into a blender with a couple of tablespoons of the soaking water. Blend into paste. Mix into the mayonnaise. Season with a little salt. 2. Preheat an outdoor or stove top griller for medium-high heat. Boil corn first in hot water until half cooked. Then grill corn until hot and lightly charred all over. 3. Roll the corn in melted butter, then spread evenly with chipotle mayonnaise. Roll in grated cheese and sprinkle with cayenne pepper. Serve with a cayenne pepper-sprinkled lime wedge. Now, do something that will seem very odd: scoop the seeds into an ungreased medium-size (8- to 9-inch) skillet along with the torn-up tortilla, set over medium heat, turn on an exhaust fan, open a window and toast your seeds and tortilla, shaking the pan regularly, until thoroughly burned to charcoal black, about 15 minutes. 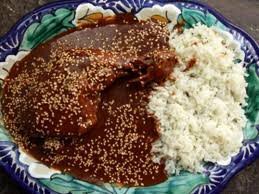 (This is very important to the flavor and color of the mole.) Now, scrape them into a fine-mesh strainer and rinse for 30 seconds or so, then transfer to a blender. Set an ungreased skillet or griddle over medium heat, lay on a piece of aluminum foil, and lay the onion slices and garlic cloves on that. Roast until soft and very dark (about 5 minutes on each side of the onion slices – peel it off the foil to turn it; about 15 minutes for the garlic – turn it frequently as it roasts). Cool the garlic a bit, peel it and combine with the onion in a large bowl. While the onion and garlic are roasting, turn on the oven to 350 degrees (for toasting nuts), return the skillet to medium heat, measure in a scant 2 cups of the lard or oil (you'll need about 1/2-inch depth), and, when hot, begin frying the chiles a couple at a time: They'll unfurl quickly, then release their aroma and piquancy (keep that exhaust on and window open) and, after about 30 seconds, have lightened in color and be well toasted (they should be crisp when cool, but not burnt smelling). Drain them well, gather them into a large bowl, cover with hot tap water, and let rehydrate for 30 minutes, stirring regularly to ensure even soaking. Drain, reserving the soaking liquid. While the chiles are soaking, toast the seeds and nuts. Spread the sesame seeds onto a baking sheet or ovenproof skillet, spread the pecans, peanuts and almonds onto another baking sheet or skillet, then set both into the oven. In about 12 minutes the sesame seeds will have toasted to a dark brown; the nuts will take slightly longer. Add all of them to the blender (reserving a few sesame seeds for garnish), along with 1 1/2 cups of the chicken broth and blend to as smooth a puree as you can. Transfer to a small bowl. Add the chile puree, stir well and let reduce over medium-low heat until very thick and almost black, about 30 minutes, stirring regularly (but, thankfully, not constantly). Stir in the remaining 7 cups of broth, the chocolate and avocado leaves (if you have them), partially cover and simmer gently for about an hour, for all the flavors to come together. Season with salt and sugar (remembering that this is quite a sweet mole and that sugar helps balance the dark, toasty flavors). Remove the avocado leaves. In batches in a loosely covered blender, puree the sauce until as smooth as possible, then pass through a medium-mesh strainer into a large bowl. 3. Finishing the dish. Return the mole to the same pot and heat it to a simmer. Nestle the leg-and-thigh quarters of the chicken into the bubbling black liquid, partially cover and time 15 minutes, then nestle in the breast quarters, partially cover and simmer for 20 to 25 minutes, until all the chicken is done. With a slotted spoon, fish out the chicken pieces and transfer them to a large warm platter. Spoon a generous amount of the mole over and around them, sprinkle with the reserved sesame seeds and set triumphantly before your lucky guests. Combine all of the ingredients in a pan with 3 cups of water. Cover and cook over very low heat for 1 to 1 1/2 hours, until the chilies are very soft and the liquid has been reduced to 1 cup. This recipe will keep for several weeks in the refrigerator in an airtight container. 2. Fry the eggplant in the olive oil until brown on both sides and set aside. Add oil as needed. browned. Stir in the tomato paste, stock, herbs and seasonings. 4. Bring to the boil. Cover and simmer for 15 minutes. mixture and top with sliced tomatoes. 6. Add the rest of the eggplant, meat and layer with the sliced potatoes. 7. Sauce: infuse the milk for the bechamel with a bay leaf, nutmeg, and herbs beforehand. sauce to the boil, stirring constantly. Beat in the egg yolks and cheese. 8. Whisk the egg whites and fold into the sauce. golden brown. If the top browns too fast, place a piece of aluminium foil gently over the top. Basic thing to remember about these kind of ‘assembly’ baked dishes: all the ingredients are already cooked more or less. The baking is primary to heat and combine flavours. And in this instance to firm up the bechamel custard on top. Preheat oven to 400F. Roll out pastry on alightly floured work surface to a 13 ½ in square. Using a large skillet as a guide cut out a 12-inch round. Transfer pastry round to baking sheet lined with parchment paper and refrigerate untl film about 15 minutes. Make three ½-inch slits in center of round, set pastry aside at room temperature. Melt butter in a 12-inch skillet, or sturdy pie pan, suitable for oven. Stir in sugar cinnamon and salt. Cook swirling skillet occasionally until mixture turns medium amber about 3 minutes. Arrange bananas in skillet overlapping slightly. Cook without stirring 3 minutes. Drizzle vanilla and kahlua over bananas and cook until most of the kahlua has evaporated and liquid has thickened about 1½ minutes. Remove from heat. Place pastry round on top of bananas and transfer to over. Bake until pastry is golden brown and puffed about 25 minutes. 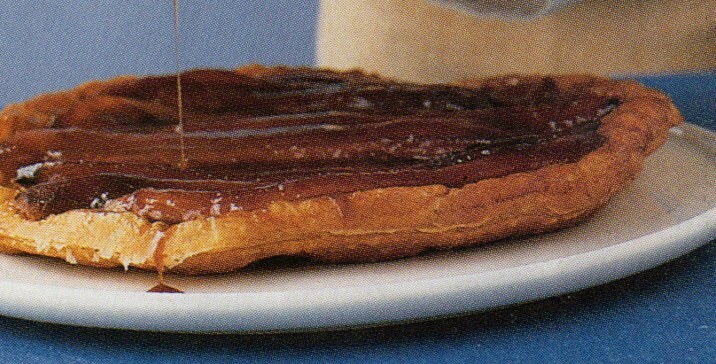 Remove from oven and carefully invert tarte Tatin onto a serving plate. Whisk crème fraîche until fluffy about 3 minutes. Serve dessert warm or at room temperature with the crème fraîche. Preheat over to 200C. Lay the puff pastry on a tray and prick well with a fork. This called docking and keeps it from expanding too much. Bake for 10-12 min or until golden. (Puff pastry is better overcooked than undercooked.) Cool. Whip the cream, lemon zest and 80g caster sugar until stiff peaks form. In a separate bowl, whip the mascarpone for 1-2 minutes until it firms a little then gently fold into the cream. Cut the cooled pastry sheet into 3 even pieces. 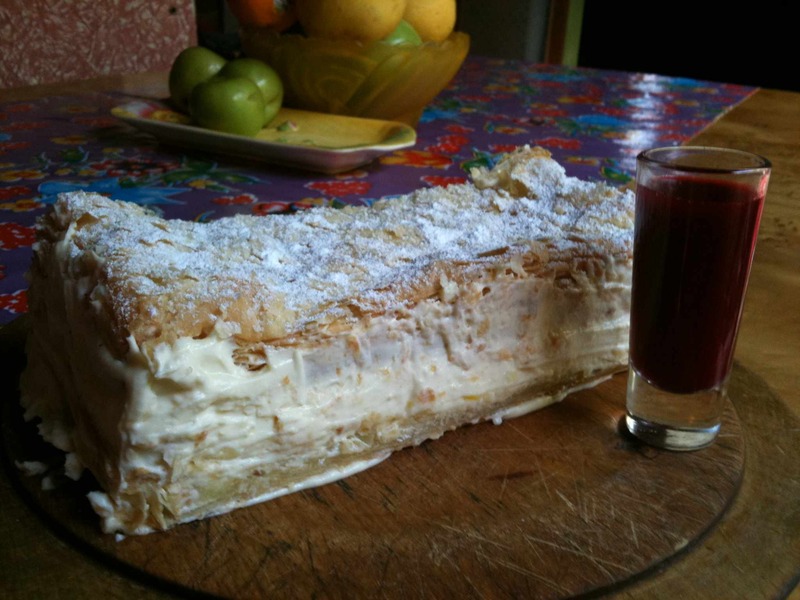 On one piece of pastry, spread some of the cream mixture to a thickness of about 2 cm. Put another length of pastry on top and repeat reserving some of the cream. Put the third pastry sheet on top and gently press down. Using a flat knife, smooth the reserved cream over the sides and ends of the log. Dust the top lightly with icing sugar. Refrigerate for at least 2 hours before serving. To serve, slice carefully with a sharp serrated knife using a sawing motion. Stand the slices up on plates and serve with raspberry coulis. Optional: mound up some grapefruit and mango or any kind of fruit next to the slice and drizzle the coulis over. Place frozen raspberries and sugar in a small saucepan. Bring to the boil, stirring and mashing with a wooden spoon, over medium heat. Simmer for one minute. Set aside to cool slightly. Press raspberries in a sieve over a jug to strain. Discard seeds. Peel the skin off and separate the segments. Peel the membrane off and cut into small pieces. Cut a mango into the same size pieces, mix with the grapefruit and sprinkle a little icing sugar over the top and mix well.